Welcome to the May 2010 edition of the IPC e-newsletter. The IPC e newsletter is distributed free to more than 4000 people around the world. During the Initial days of the month of April our site was attacked by a malware. ( Malware, short for malicious software, is software designed to infiltrate a computer system without the owner's informed consent.) Google labeled our website as 'This site may harm your computer'. After spending several hours, scrutinizing the codes for finding and removing the malicious script which had injected into our pages, in around two weeks time we had removed the infected script and reloaded the entire site. Google has also given us a clean chit. The site is now completely restored. The inconvenience is regretted. We are still in the process of finding the source of the attack. It could be either accidental or intentional. Sick of cables and hoses connecting the powder spray gun to the control module? Introducing IPC - Lirpa TS1 (BETA), A hardware and software combo pack which will replace the conventional powder coating applicator. You can control the powder coating gun via blue tooth through a PC/Laptop/Mobile phone. This economical and simple wireless software will simulate and generate all the controls of electrical, pneumatic and chromatic parameters. For all our friends in electroplating field we have added a new page on glossary of terms used in electroplating. Click here to visit the page and suggest more terms if you can. Green Gone Wrong’: Can Capitalism Save the Planet? IT may seem quaint to recall this now, but on the eve of the financial crisis, one of the biggest business stories was how large corporations were going to save the planet and make billions of dollars for their shareholders at the same time. Go to Blog USA Today wrote glowingly about Wal-Mart’s push to sell environmentally friendly light bulbs. Fortune gushed that Goldman Sachs, Continental Airlines and DuPont had jumped on the ecological bandwagon. The global economic collapse pushed the rise of green capitalism off business magazine covers, but it will surely resurface. After all, Wal-Mart and G.E. are still pushing it. In a recession, they need all the good publicity they can get. 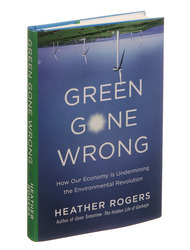 Now, along comes Heather Rogers, who warns about the dangers of buying into this mind-set with “Green Gone Wrong: How Our Economy Is Undermining the Environmental Revolution” (Scribner, 272 pages, $26). She says green capitalism is actually undermining ecological progress. Earth Day on April 22 has started getting more buy in from corporates. Going beyond customary tree plantation under their corporate social responsibility (CSR) initiatives, companies are now increasingly marking the annual day with the launch of green products and services. The emphasis is also on striking partnership between governments, companies and NGOs. There is a buzz about green buildings. But the question is: what does one mean by building green? And how does one design policies to make the green homes of our dreams? Green is not about first building structures using lots of material and energy, and then fixing them so that they become a little more efficient. Building green is about optimizing on the local ecology, using local material as far as possible and, most importantly, building to cut the power, water and material requirements. Take the glitzy airport building Delhi will soon get. Developers say it will come with a green tag. This is because the airport is investing in energy-efficient lighting, sewage disposal and rainwater harvesting. All these are important initiatives but the question remains: could the airport have been designed differently so that it used much less energy in the first place? For instance, the challenge before green airports today is to make them compact to reduce the time it takes from entering the building to entering the aircraft. This ‘frugal’ planning will make everything more efficient—take less building materials to build and less energy to cool and heat. But planners first think of building the biggest structures and then try sugarcoating them. I say this without even discussing the need for airports to give way to other modes of much more efficient transport like railways. If one begins to think green in a locally appropriate way, one will realize that traditional architecture was green in many ways. Every part of India had its unique stamp of buildings. This is because creative and architectural diversity was built on biological diversity. So buildings in hot regions would ensure corridors directed the wind so that it naturally cooled the interiors. In wetter regions architects would build using the natural breeze and light. All in all, traditional architects knew how to optimize the use of elements. Today, Indians have forgotten how to build for their environment. Instead, modern buildings are examples of monocultures—lifted from the building books of cold countries where glass facades are good to look at and appropriate for their climate. The same building in India is a nightmare; the glass traps the heat. The building cannot be naturally cooled because windows cannot be opened. It needs central air-conditioning and heating. In this situation, turning the building green means using very expensive glass to insulate better. Builders avoid this. So the only band-aid green measures left are to include a few token items like efficient lights and water-saving devices in the toilets. Architects say God is in the details. In this case, the details are about both simplicity and diversity. In large parts of India, where the sun is both the source of light and heat, traditional architecture made use of a small but critical detail: the window shade. Modern facades are built without these shades because they don’t fit the image of the western building. Just raise your head and look at the glitzy building out there, you won’t find this simple but effective detail. Clearly, the buildings of the green future have to be different. This will require setting the right policy so that practice can follow. The fact is even today we have no mandatory green standards for builders to follow. The National Building Code does not include energy, water or material efficiency standard. The only standard that exists is for energy—the Energy Conservation Building Code—and it is voluntary. The first and urgent step is to incorporate this voluntary energy code into the mandatory National Building Code. The second step is to ensure its implementation so that builders measure and reduce the energy usage of their construction. But most importantly, the code must be developed so that it sets the mandatory benchmark for builders to follow—tough standards for energy usage for each square metre of built-up area. This will then allow architects and builders to do things differently. They can build for efficiency and cut costs rather than build for inefficiency and then spend money on making the building more efficient. This will bring back the knowledge and practice of building to maximize passive energy, natural light and wind, while keeping away the heat. Simultaneously, the code needs to be expanded to include water and waste standards—to reduce water usage in toilets—and to ensure that institutions and large residential complexes recycle and reuse sewage. Similarly, these complexes must be provided space to compost kitchen waste. But priority should be segregating solid waste. Separate what can be composted or recycled and minimize what cannot be reused (like plastic). With the tightening of government legislation around the globe to reduce the use of materials containing air polluting VOC, including architectural and industrial coatings, DuPont™ Abcite® is being recognised as a promising alternative by metal finishing companies and their clients embracing the challenge of a cleaner environment. An example in Asia Pacific is the Hong Kong Air Pollution Control Regulations being phased in over 3 years from 1 April 2007. These regulations aim to control VOC (Volatile Organic Compound) emissions, a major category of pollutants, in the territory. As a result, all coatings have to be registered with the authorities, and those with a VOC content above the regulated limit are to be prohibited. DuPont™ Abcite® is a VOC free, high build (250 to 1000 micron), tough thermoplastic coating which provides an environmentally safe and user friendly long term corrosion protection solution. Offering excellent adhesion without the need for a primer, Abcite® can be applied in one step in areas where maximum resistance to mechanical damage and extended service life to first maintenance are required. Thanks to its fire safe properties (low smoke, low toxicity and halogen free), Abcite® coatings are suitable for use in confined spaces including rail, road and mining tunnels plus off-shore oil rigs and shipping. The Hong-Kong Electric Lamma Power Station located on Lamma Island, planned to expand their generating capacity and due to limited space within the existing site, land was reclaimed from the sea. 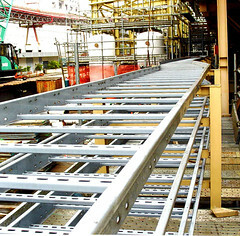 DuPont™ Abcite® was selected as one of the coating materials for the cable supporting system of Unit 9 in 2005. “The subtropical climate of Hong-Kong, with seasonal high temperatures around 35 Deg.C. accompanied by high UV, humidity, and salinity, is very aggressive and the selection of Abcite® protective coatings was considered suitable for this project" comments Nick James, business development consultant for DuPont Polymer Powders in Asia. “Its technical features, such as VOC free, UV tolerance, durability, mechanical, impact and chemical resistance, salt water and fire resistance and the fact that no adhesive primer is needed makes it an ideal coating solution for demanding construction projects above and below ground in the region. In addition, Abcite® can be easily repaired in situ. The alternative would have been stainless steel but at treble cost vs the current solution”. Along with the existing Abcite® standard and custom colour range supplied to meet the needs of a wide range of industrial markets including Automotive Components, Cable Supports, Fencing, Garden and Street Furniture, Ship and Dredging Barge Pipework and Potable Water Pipe and Fittings, DuPont is developing a range of ‘Stainless Steel look”’ topical silver finishes for demanding outdoor applications where inflated stainless steel costs have become prohibitive and where an affordable stainless steel look offers a lasting visual enhancement of the final product Anti-microbial Abcite® coating grades are also available. From a practical and logistics point of view, Abcite® coatings are particularly user friendly in warmer climates as they require minimum temperature control for bag or tank storage to retain the quality of the material, and also provide labour cost savings and improved delivery times as the high build coating is applied in one single step Furthermore, the flexibility of application method (fluidised bed dipping, rotational tumble, flock spray, electro-spray and flame spray) minimises or even avoids capital investment. Applied to suitably prepared substrates such as pre-treated mild steel, galvanized and stainless steel, the result is a high build coating with full coverage of dressed welds, edges, wire mesh intersections and fabrication blemishes. Repair methods for accidental mechanical damage or damage caused by cutting coated items on-site include compatible multi-coat wet paint systems, preheat and localised powder application, flame spray, and the unique Abcite® patch repair system developed and tested by DuPont (application in 10 seconds). The DuPont Abcite® coatings range are manufactured under ISO 9001 & ISO 14001 certified conditions (full certification available upon on request). Traditional paints were developed by solubilising a resin (polymer) into a solvent (generally an organic solvent called “VOC”), and by adding colour pigments, additives and fillers or extenders. In the 70’s, environmental concerns began to grow and new coating developments focused on reducing the amount of organic solvents used in liquid paints. This marked the beginning of the era of waterborne coatings. However, even when wet coatings are water based, a certain amount of coalescing agents and co-solvents (which are VOC) are required. These organic compounds are used for different reasons, for instance to help dissolve the resin in water, to reduce surface tension during application, to better control the drying process (ambient air drying or oven) and to obtain better gloss. At the same time, other high build thermoplastic and thin film thermosetting coating technologies were developed to avoid the use of solvents. These products, called powder coatings (or dry coatings), do not contain organic solvents (or VOC) or water. WASHINGTON – As of April 22, 2010, the U.S. Environmental Protection Agency requires that renovations and repairs of pre-1978 housing must now be conducted using safe practices to protect children and pregnant women from exposure to lead-based paint. EPA proposed the Lead Renovation, Repair and Painting Rule, which requires contractors to be trained and certified in lead-safe work practices, in 2006. In 2008, EPA finalized the rule and set April 22, 2010, as the implementation date. To date, EPA has certified 204 training providers who have conducted more than 6,900 courses, training an estimated 160,000 people in the construction and remodeling industries to use lead-safe work practices. The new rule requires that renovation firms must be certified by the EPA, individuals must be trained in lead-safe work practices, and that all those providing training must be EPA accredited. EPA will continue to provide support and assistance to states, industry and communities on all aspects of implementing this rule. Recognizing the large number of contractors and homes subject to the rule, EPA is increasing its outreach efforts and providing guidance to facilitate compliance and ease the transition period following the rule’s effective date. This guidance can be obtained at www.epa.gov/lead. EPA has an 800 number to respond to inquiries about the new requirements: 800/424.5323. At a time when “environmentally friendly” is in great demand, paint and adhesive manufacturers are seeking effective answers to their product development challenges. That’s why Celanese Emulsion Polymers at this year’s American Coatings Show (ACS) is inviting the industry to take a fresh look at vinyl-based technology to help deliver a new generation of eco-friendly products high in performance and low in environmental impact. With a full line-up of new products on display at ACS, Celanese is demonstrating the value of vinyl-based emulsions for a variety of applications. Compared with other technologies, Celanese vinyl emulsions, especially vinyl acetate/ethylene (VAE), demonstrate greater performance while having a smaller carbon footprint than other traditional acrylic-based technologies, according to the company. Moreover, vinyl-based technology has been shown to be a source-stable raw material even as others face supply constraints and price hikes. Jersey City residents can learn about the proposed cleanup of a contaminated site on Garfield Avenue and steps to protect public health during a meeting tonight. The Chromium Cleanup Partnership will hold a meeting at 6:30 p.m. at the Mary McLeod Bethune Life Center, 140 Dr. Martin Luther King Drive, Jersey City. The partnership, headed by court-appointed site administrator Mike McCabe, consists of representatives from the state Department of Environmental Protection, Jersey City and PPG Industries, the company responsible for overseeing the remediation of 20 chromium contaminated sites in Hudson. Representatives from PPG will present plans for the proposed clean-up of a 16-acre site at 900 Garfield Ave. Information on what steps will be taken to protect public health while the work is being done will also be presented. Oberboihingen – Lots of valuable leads, numerous concrete RFQs and business transacted directly at the event assured a good mood amongst the 327 exhibitors at the 3rd PaintExpo. And this offers good reason to hope that growth can once again be expected in the coatings industry, which has already been substantiated by the 3rd edition of the leading international trade fair for industrial coating technology which took place in Karlsruhe (Germany) from the 13th through the 16th of April, 2010: Exhibitor numbers increased by 14%, and PaintExpo visitor numbers grew by 8% to a total of 6397. “PaintExpo is very well accepted by our customers and other interested parties because it offers an extremely clear-cut picture of the entire coatings industry. All of the relevant companies from all fields of industrial coating technology are represented here in a concentrated fashion. We’re very satisfied with the quantity and the quality of the visitors again this year”, reports Martin Weidisch from marketing services at J. Wagner GmbH, who has participated at all three events to date. And industry presence was concentrated like never before: 327 exhibitors, 14% more than in 2008, took part at the 3rd edition of the specialised trade fair for industrial coating technology. 20.5% of the exhibitors came from outside of Germany, representing 15 different countries. Trade fair offerings, which were focused exclusively on products and services for the entire scope of the liquid painting, powder coating and coil coating process sequences, attracted 6397 visitors to Karlsruhe – an 8% increase. Foreign visitors who journeyed from a total of 62 countries made up roughly 19,5% of the total number. This growth, as well as increasing levels of internationalism, underscore PaintExpo’s undisputed top ranking as an industry event for industrial coating technology. In addition to the large numbers of specialist visitors, the exhibitors were also enthusiastic about their technical qualifications and decision making authority. “Visitors who attend PaintExpo are a dream-come-true for anyone who’s involved with customer consultation. All of them are engineers, technicians or process engineering experts – exactly the kind of people we want to hook up with. We’re able to discuss things with them at a highly technical level”, explains Achim Trefz, assistant sales manager from SATA GmbH & Co. KG. Things took on very concrete contours at the booth operated by I.L.S. Vertriebs GmbH & Co. KG as well, as described by sales manager Michael Müller: “PaintExpo is demonstrating very positive development, and has been extremely successful for us. We had more visitors at our booth and customers who placed orders that we did at the last trade fair.” Lübbo Röttgers, director of application technology for GI liquids at Relius Coatings GmbH & Co. KG, who participated at the leading trade fair for industrial coating technology for the first time together with BASF, summed things up in a similar way: “We were able to establish good contacts at PaintExpo, and we’ve discovered that the decision makers really do come to this trade fair.” Frank Wübben, district manager of the European division for industrial and automotive equipment at Graco GmbH, is also very pleased with the way things went at the trade fair: “It’s strictly a technical trade fair without any so-called hunter-gatherers, but rather specialist visitors only. This made it possible for us to pick up highly interesting leads, and I assume that we’ll exhibit at PaintExpo again in 2012.” Siegfried Nittmann of Nittmann Filters for painting and air-conditioning systems is already convinced that he’ll participate at the trade fair again in two years: “Lots of customers have visited us here, and numerous new contacts have been established with employees from companies in the automobile and automotive supplier industries, as well as from the electronics industry and machinery manufacturing all over Europe. Experience has shown that customer relations evolve from roughly 50% of the contacts we make at PaintExpo. And we’ll have a bigger booth at the trade fair in 2012 for this reason”, says the company’s proprietor. Bettina Love, assistant to general management at SurTec Deutschland GmbH arrives at nearly identical conclusions: “Our first appearance at PaintExpo has paid off, and we’ll be back again next time around.” Some of the exhibitors were surprised by the high levels of visitor internationalism. “We’ve received lots of concrete RFQs for our water treatment technology division. It’s been somewhat surprising for me that project RFQs have come to a large extent from North Rhine – Westphalia and northern Germany on the one hand, and on the other hand from foreign visitors. In some cases from neighbouring countries like Switzerland, Austria and France, but also from visitors from, for example, the USA, Kazakhstan, Greece, Scandinavia and Slovakia. My impression is that PaintExpo has become more international”, explains Stephan Heuer, managing director of Hardo Heuer GmbH. “We participated for the first time at PaintExpo this year, and things went surprisingly well for us at the trade fair. The visitors were highly interested and very knowledgeable. During our discussions it became apparent that we were dealing with employees of industrial companies who were looking for solutions to actual problems. And they came from both inside and outside of Germany. We had visitors from Saudi Arabia, Taiwan, Korea, France, Holland, Italy, Spain, Poland, Russia and other countries at our booth“, sums up Rüdiger Kaiser, sales manager at E.M.M. Deutschland GmbH. PaintExpo is first choice for users around the world as well, wherever solutions are required for the liquid painting, powder coating and coil coating process sequences. This is not least due to the fact that the leading trade fair is focused exclusively on industrial coating technology, and presents internationally comprehensive and diverse offerings ranging from pre-treatment, paints and application techniques, right on up to final inspection. 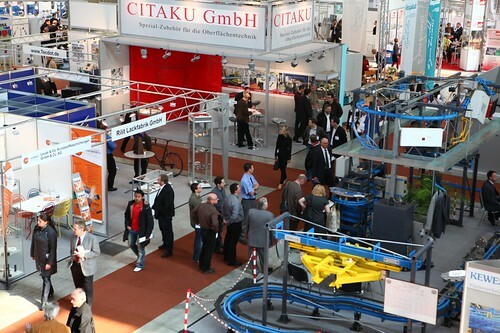 The next PaintExpo, leading international trade fair for industrial coating technology, will take place in Karlsruhe from the 17th through the 20th of April, 2012. We would be pleased to receive copies of, or links from/to, all of the publications in which the contents of this press release appear. It was interesting to meet Sandesh Mulgaonkar (Technical Manager EC) and Sharad Saxena (Sales Manager CED) from PPG Industrial Coatings. They told us about the Technical and Commercial aspects of the Electro Deposition Process and the future of ED process in India. An electrocoating system applies a charge to a metal part that is immersed in a coating bath. The process is highly automated and results in a high performing finish that delivers a uniform film build, colour consistency, high yield rates and applied cost efficiency, in an environmentally friendly finishing system. PPG Industrial Coatings has earned a reputation for innovative, high-performance products and world-class service. Serving the world’s top manufacturers and supply chain partners with a wide range of leading technologies, PPG enables customers to achieve their industrial coatings goals. Since 1970-1975 the Zinc flake coating system is available in comparison with electrolytic applied zinc with higher corrosion protection. In the beginning producers were using hex chromium as a co-formulator to enhance corrosion protection, now a day’s chromium free zinc flake coatings also available with organic and inorganic colour sealer top coats in the market. The combination of Zinc flake base and different organic or inorganic top coats gives superior properties and it is applied for almost every metal part in Industry with help of different application techniques like and advanced coating machineries. What is Zinc Flake Technology? Polymet™ Zinc Flake coatings were made by combination of Zinc and Aluminum flakes, electrically conductive Binder system with integrated lubricants for adjusting co-efficient of friction. The coating is conductive which helps to protect cathodically and aluminum flake helps to reduce of white oxidation buildup. The Polymet™ coatings are Non-Electrolytically applied by mechanical application techniques with combination of Organic or Inorganic top coat sealers. Polymet™ coating offers high performance corrosion protection for bulk components. It is applied using a so-called dip-spinning process. The layer is made up of a base coat and a top coat. The inorganic base coat is made up of zinc and aluminium flakes. The zinc gives cathodic corrosion protection. What is more, the zinc and aluminium flakes produced in the dry film form a barrier to reduce the impact of corrosive media including oxygen, electrolytes, etc. thereby enhancing the life of the complete protective system. Both organic and inorganic coating systems are available for the top coat, each offering excellent protection from mechanical and chemical impact. Protection against contact corrosion is enhanced and abrasion resistance is clearly increased. Integrated dry film lubricants help achieve defined friction coefficients. When combined with other processes, the zinc flake system offers excellent protection against corrosion as well as resistance to chemicals and is clearly superior to comparable systems. There are a number of components which are combined to produce a high performance protective coating. For specific applications, we are able to formulate a specific product that will achieve optimum performance. As can be seen, the wide variety of components gives a wide spectrum of possibilities to solve any coating requirement need. Each coating formulation will have a number of components which can be combined for optimum technical performance within the cost/price economic window. Binders are the materials which hold the other protective coating components to one another and to the surface of the substrate. Metallic Pigments provide sacrificial protection to the substrate; these are metals that are more reactive than the substrate. While many metallic pigments are used. The flake pigments give a brighter appearance than the dusts, which give a flat matt appearance. Corrosion protection is generally similar, although flake pigments offer better corrosion protection. Lubricants reduce the coefficient of friction of the coating, resulting in improved torque-tension relationships for threaded fastener assemblies and improved bulk processing of parts. The lubricating pigments are selected according to price-performance parameters. What Coating thickness is applied? Generally, the coating thickness ranges from 5-15 microns. The corrosion resistance can be achieved over 1000 hours by ASTM B117 in Salt Spray test; The results of corrosion depends up on the shape and geometry of the parts. Giving a makeover for your house will get more expensive from April due to a hike in the prices of paints. The quantum of hike is yet to be determined, but Bangalore’s paint industry expects it to be around five per cent. The increase is being attributed to a hike in excise duty on paints and rise in costs of raw material, including crude oil. Many dealers have been alerted about the price hike by the companies they deal with. Prakash, proprietor of Mathaji Hardware at Koramangala, said, “We have received a circular from Asian paints stating that the price of paint will increase by April first week. The hike has been attributed to a two per cent increase in tax and increase in the prices of petroleum products that are used as raw material for enamel paints. The price rise would be between Rs 3 to Rs 5 per litre.” Some dealers are warning of a five to 10 per cent increase in prices. Market leaders like Kansai Nerolac have indicated a price rise of around 5 - 8 percent. Some more manufacturers have announced the hike with immediate effect, some to follow them. Many prefer to keep silent on this issue. "This is not an issue to be discussed in an open forum" they say. However, one of the small scale powder manufacturer commented, " We are dealing only with a filtered segment of customers. Any change in the price structure will certainly create a disturbance and reshuffling of our customers users. We are worried to take the risk"
Just visualize a photo of Rama and you will always see Hanumana sitting at his feet with all reverence in his eyes, hands folded and the tail a wee bit to the ground. Same is the case of powder manufacturer’s due to their own doing in the form of price war and the race to sell more even at a non-profitable price. This is due to more players than the demand can absorb, not that all are quality players albeit more of them are in the also ran category catering to the unorganized sector of powder coaters. This situation has largely changed in the past year after the auto sector saw booming sales thereby increasing the demand at the end of the big giant’s manufacturers who were busy with their OE customers. At the present juncture, no matter what, it is an opportune time for all the powder manufacturers to correct the pricing of their products so as to generate a reasonable profit and grow. They need not fear of loosing orders or customers due to price rise. The reason being a demand surge in the market for powders and a peculiar situation of epoxy resin shortage due to various reasons is likely to continue for a year and then too nobody is sure of epoxy resin price roll back. As all input costs have risen tremendously (15% to 20%), there is no way but to increase powder prices just to survive. The lesson for the customer is that you be the Rama but ensure that your Hanumana does survive or you may be colourless. Without Hanumana could Rama have the Glory?" Its a time of turmoil for the powder market. Issues like Squeezed margins, fierce competition and over due payments are also to be addressed. Demand from the Far East plus production constraints on raw material suppliers could mean paint shortages in the UK, according to Tony Mash, CEO of the British Coatings Federation. The economic recovery currently being experienced by the Far East has stimulated sales of coatings and, with it, demand for the raw materials that go into paint and powder coatings formulations," he says. However, for a wide range of raw materials used by the coatings industry, a combination of increasing demand, maintenance shut downs and major plant breakdowns around the world has led to a situation where many ingredients are either in short supply, on exasperatingly long lead times, on force majeure or allocation. BCF members have reported shortages particularly of epoxy resins and titanium dioxide over the last few months. Now, various grades of PVC, several plasticisers, acrylic acid and butyl acrylic, phthalic anhydride, china clay, raw wood oil, plastic packaging materials and even tin plate are also in a tight supply situation; all materials that are used in paint manufacture. Many of our subscribers could not stop themselves visiting this page for more information on the Lirpa TS1 ( April 1st in reverse) Bluetooth USB mobile controlled powder spray gun. We were not alone to play the prank. April Fools’ day, wasn’t missed by AkzoNobel, who released a fantastic press release on how they have converted ’science fiction into science fact’ and developed a ‘revolutionary’ new paint ‘which cracks one of the biggest ever scientific challenges - invisibility’. According to the firm, people wearing garments coated with the high-tech textile coating Invisulux become invisible. In collaboration with Professor Proli the company has created a special molecule which manipulates the visible portion of the electromagnetic spectrum and allows light to pass straight through. Asian Paints has announced that the company's new paint plant at Rohtak in the State of Haryana has commenced commercial production on 12 April 2010 after the formal inauguration. The plant has an initial capacity of 1,50,000 KL per annum and can be scaled to 4,00,000 KL per annum in future expansions. The National Advertising Division (NAD) of the Council of Better Business Bureaus has recommended that The Sherwin-Williams Company modify or discontinue certain odor-elimination claims for the company’s Dutch Boy Refresh Paint. The company will appeal certain NAD findings to the National Advertising Review Board. The POS material included a diagram that depicts odor malodor particles near a wall before and then after an application of Refresh paint. The diagram showed many malodor particles in the “before” sketch and only a few particle in the “after” depiction. AMSTERDAM, The Netherlands - AkzoNobel has renamed the ICI India business. It is now officially known as Akzo Nobel India Limited. ICI India, a separate listed company on the stock market, is one of the country's leading decorative paints businesses. The change marks another step in the integration activities following AkzoNobel’s acquisition of ICI. Led by Managing Director Amit Jain under the same Board of Directors, the rebranded business will continue to play a pivotal role in the company's strategic growth plans. "We are delighted that ICI India has now officially taken on the AkzoNobel name," said CEO Hans Wijers. "India is a very important market for us, and we are now well prepared to take full advantage of the world-class capabilities of our Indian decorative paints organization and build on our promising market position." CI Logistics has designed, manufactured and installed its Conveyors International 458 overhead conveyor system into the new powder coating plant at JCB Heavy Products in Uttoxeter, Staffordshire. The heavy duty, drop forged conveyor provides continuous, reliable transport for a range of fabrications through the various stages of the painting facility. This modern powder coating plant is part of a new installation to increase the capacity of JCB Heavy Products based in a 450,000 sq ft purpose built factory alongside the A50. JCB’s Heavy Products manufactures excavators weighing up to 46 tonnes for the global market. Inside the painting facility excavator parts are loaded manually onto robust saw-toothed flight bars for their overhead journey around the paint plant. These special flight bars make the conveyor very versatile as the products can be hung securely from any part of the flight bar. Hungarian paint company Poli-Farbe and chemicals giant DuPont will put a jointly developed family of paint products on the market in the framework of a licensing contract, the companies announced on Wednesday. The products contain Teflon, making the surfaces they cover resistant to dirt and easy to clean, said Poli-Farbe managing director Antal Szabó. The products are expected to be sold in Hungary and Slovakia, he added. DuPont has signed about 25 similar contracts, said Joice de Voe, international director for licensing for DuPont Titanium Technologies. What do you want to glow in the dark? Whether you want a ladder that you can find in the garage at night, firefighting tools that can be seen through thick smoke or white walls that light up in the dark without batteries, GlowZone in Brea has developed the technology to make them. Many consumers are familiar with glow-in-the-dark toys or tape and the cyclists' clothing that reflects headlights. But GlowZone is a research and manufacturing firm that specializes in ways to infuse photoluminescence - glow in the dark compounds into products and fabrics, not merely sit on top or reflect light. Founder Joe Bloomfield didn't invent the compounds, but he and his 9 employees have spent the past nine years on research and development of ways to make photoluminescence brighter, in a variety of colors other than green and to apply it to various products. GlowZone might use powder coating (sprayon paint and bake it) on a ladder. Or put the glow material into liquid plastic and make objects through injection molding. Or put photoluminescent compounds into fabric that is sewn on to firefighters' jackets. Or use vinyl dip molding to coat an air tank (like dipping an ice cream cone in liquid chocolate). The Minnesota Beautiful program, through the Initiative Foundation in partnership with Valspar Corporation, has chosen several area community and nonprofit organizations to receive more than 570 gallons of free paint and coatings. SHELBY — If you’re ready for some good news, PPG Industries is ready to tell it. “It’s good to have some good news for a change,” Mathis told The Star Tuesday afternoon. “In ’08 we were operating three furnaces and dropped to two, and have been operating two since then. Now we’re going back to three … where we were before all this started. I have a question, we have a Powder Process here in our facility, and we use a PPG Epoxy, and it doesn’t pass an accelerated exposure test. Question is, this kind of Powder does or doesn’t pass the QUV test? Because we are having troubles with our customers. Thank you for the question, this is a good one. The QUV test simulates the exposure a coating will experience in a high intensity UV environment. The wavelengths are close but not identical to the sun. It is a decent comparative test for similar formulations. Epoxies will not last long in a QUV chamber without fading and chalking. Similarly a hybrid powder coating which also contains epoxy resin will not resist degradation in the QUV cabinet. Powder coatings that have good to excellent QUV performance are based on the following chemistries: aliphatic polyurethanes, polyester TGIC, polyester HAA, acrylic and fluoropolymer. Pigmentation also has a strong influence on UV resistance. Mixed metal oxides have the best performance. If you need more guidance please let me know. Is there any truth to shot blast being able to “impregnate” oils in the surface of steel? I have a product that gets E-coated off site, and I want to shot blast the product versus hand cleaning, but my customer is concerned. Your customer has reason to be concerned. Shot blasting can be a very good pretreatment process before powder coating or painting a metal surface. The issue develops if the shot blasting process is sloppy. It is imperative to have clean blasting media. If the blasting media gets contaminated, yes it will embed the surface with dirt and oil. The microscopically embedded contaminates will compromise the corrosion resistance of the finish. This doesn't mean shot blasting can't be used as a pretreatment, it's just really important to keep the process and media extremely clean. In fact a good shot blast process is better than simple solvent cleaning because the blasting, when done correctly, provides better adhesion. This is because it creates a profile on microscopic peaks and valleys that allow the coating to 'bite" into. I hope you don't mind me troubling you with a question regarding the failure of the epoxy/polyester powder coat to the metal on the equipment in my office. I found your site while searching the internet for answers. I am a dentist in Florida and am experiencing problems with the finish to my dental equipment. The equipment is 3 years old and the the paint is bubbling up and chipping off the delivery units which is that movable tray holder that the instruments sit on. I have never seen this before in the 25 years that I have been working in dental offices. The paint is covered with a protective plastic that is lightly adhesive and disposed of after each patient. The paint is wiped down with a hospital grade disinfectant wipe after every patient as well. We first starting noticing the bubbling and "corrosion" about 18 months of use. I have had dental equipment that was over 40 years old, disinfectant with diluted bleach that never displayed this type of wear. The manufacturer said they never experienced this phenomenon on any of their products. They used epoxy/polyester powdercoat. They insist the units were manufactured in the US according to FDA standards. Can you think of any reason why this would happen? If you need photos I can email them to you. I sincerely appreciate any insight you can offer to this problem. 1. Incorrect or poor quality powder coating - The applicator may have pulled the wrong product off the shelf (e.g. mistook one white powder for another) and applied it to the dental equipment. A standard polyester product would not have the chemical or solvent resistance that a hybrid would. A more remote possibility would be a lousy quality batch of powder coating as supplied by the powder manufacturer. This doesn't happen very often however. 2. Inadequately cured powder coating - The applicator may have applied the proper coating, but didn't bake it at high enough temperature or time to adequately harden or cure the coating. An undercured powder coating will have poor chemical resistance and could blister and lose adhesion. 3. Poorly cleaned and pretreated metal prior to powder application - This is highly probable. If the instrument parts weren't thoroughly cleaned and pretreated prior to applying powder coating, this could result in premature bubbling and adhesion failure. Adequate cleaning and pretreatment would consist of a minimum of 5 stages including an alkaline cleaner, intermediate rinses and the application of a phosphate solution. Without this the coating will not anchor to the metal substrate and will subsequently corrode and lose adhesion. As for the FDA standards, these regulate the composition of the powder coating. Details are contained in the Code of Federal Register (CFR) 175.300. The purpose of this is to ensure nothing leaches out of the coating that could harm a human. It does not regulate the performance or durability of the coating. Did the equipment manufacturer provide a warranty for the performance of the equipment? I would think they are responsible for the durability of the equipment including its finish. They should correct the problem or replace the equipment. It would then be up to them to pursue the powder coating applicator (if it is not them). It would be helpful to send me pictures. I could then comment further on the mode of failure and its possible cause(s). Please let me know how I can help you further.